There’s something for everyone and if you’d like to be involved please download the Volunteering Form which gives more detailed information. Extraordinary ministers of Holy Communion are adults with a deep love for the Eucharist commissioned to serve the body and blood of Christ to the people of Sacred Heart parish during mass and visit the sick with Holy Communion. If you’re interested in volunteering for this ministry please contact Fr Colin. 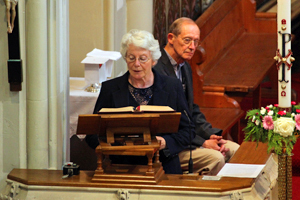 Readers at Sacred Heart are parishioners who are comfortable speaking to large audiences. Proclaiming the word of God is not only a service but a gift that is meant to be shared. As a reader you are called to be living servants of the Living Word of God, as you proclaim the scripture readings at the Liturgy. The role of the altar server is to assist the Priest during the Liturgy of the Mass. We welcome both children and adults to be altar servers. As a welcomer you offer hospitality to the community as they enter into the celebration of Mass, making each member of the congregation feel personally welcomed into the church and providing each person with a hymnbook etc. New parishioners are encouraged to volunteer for this ministry, it’s a wonderful way to meet your parish family. The mission of a welcome is to minister to the community through hospitality and welcome. The Music Group at Sacred Heart welcomes anyone interested in helping with the music for our weekend and feast day liturgies. Our music is based on the readings for each Sunday or feast day, and incorporates a wide range of musical styles, from Latin chant to contemporary compositions. 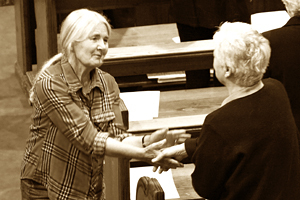 Our aim is to support and encourage the congregation to participate as fully as possible in the liturgy. At the Sacred Heart we have a very enthusiastic parish choir which, currently, numbers some 20 men and women. The choir sings on Sundays at the 11:30 Mass and also at Mass on most major feast days under the direction of our Organist and Master of Music, Stephen Groves, assisted by professional singer Jane Money. Sunday Mass at 11:30 (Missa normativa) is celebrated in English with Latin and the music includes both Gregorian Chant and Polyphony. On major feast days you will probably hear a splendid setting of the Mass by one of the great composers while on ordinary Sundays, the Mass setting is generally plainsong and the congregation is encouraged to participate in the antiphonal singing of these with the choir. 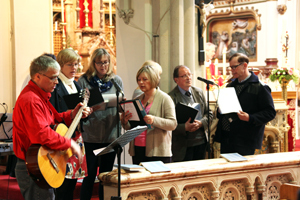 The choir also draws upon a large repertoire of motets in Latin, English and other European languages for use at Mass but there are always two or three congregational hymns, carefully chosen to suit the liturgy of the day. On most Sundays the 9:30 is supported by a choir of adults and children. The aim of this choir is to get everyone in church to sing and raise the roof in congregational song! So in a way everyone coming to church at 9:30 is part of this choir. However, we would be very pleased to welcome any keen singers at the front. If you play an instrument, be it guitar, keyboard, brass, woodwind or strings, we’d love you to join us; please come and have a chat after any of the 9:30 Masses.